Warner Brothers has revealed a sneak peak at one of the seven ‘Maximum Movie Mode’ scenes included on the eagerly awaited ‘Harry Potter and the Deathly Hallows: Part 1’ Blu-ray Disc, released throughout Europe in April. Earlier this year we brought you news that the film was set to make its BD debut and noted the new function would be worth waiting for. You can check out Entertainment Weekly’s exclusive clip. ‘Maximum Movie Mode’ allows Potter enthusiasts to access the ins and outs of plots and characters spread across the saga in an informative guide lead by actor Jason Issacs, who plays the evil Lucius Malfoy. Alongside filming techniques and production facts it includes commentary from director David Yates and stars Daniel Radcliffe, Rupert Grint, Emma Watson and Tom Felton. We’ll be sure to keep you up to speed on any additional Blu-ray announcements so stay tuned. If you’re excited for the final installment due in cinemas soon why not head over to Warnerbros.com for a special behind-the-scenes clip. Entertainment Weekly has the full story. Good news muggles! 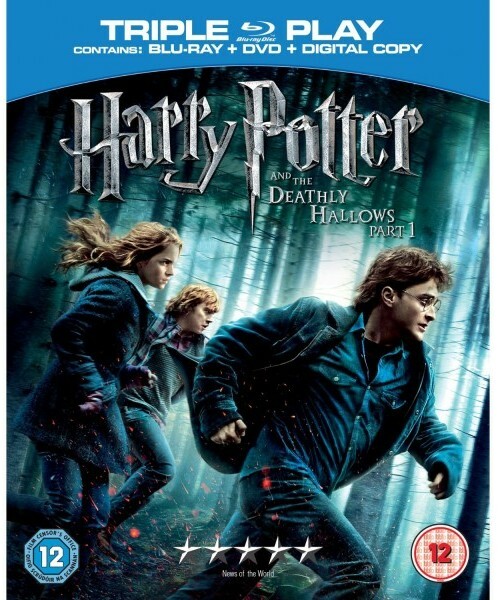 Warner Brothers has released Blu-ray Disc details of the penultimate Potter installment, ‘Harry Potter and the Deathly Hallows: Part 1’. Available in the UK from 11th April and the rest of Europe soon after, fans can look forward to a whole host of enchanting extras. ‘Harry Potter and the Deathly Hallows: Part 1’ follows Harry (Daniel Radcliffe), Ron (Rupert Grint) and Hermione (Emma Watson) on their perilous mission to destroy the remaining horcruxes and defeat Lord Voldemort. Two Blu-rays, a DVD and a digital copy of the movie complete the triple play pack and features exclusive to the Blu-rays include seven ‘Maximum Movie Mode’ scenes, revealing film tricks, green screen magic, amazing set design and location tours of the Weasley Burrow, the Dursley House and the Ministry of Magic. Fans of the wizarding world voted in their thousands via a Facebook competition fronted by Watson to choose the BD cover. We think it looks great, what about you? With the final chapter due in cinemas this summer, we’re sure this won’t be the last we write about the boy wizard so until then – “Mischief Managed”. Heyuguys has the full story. Avid Harry Potter fans will be pleased with the latest announcement from Warner Home Video that Ultimate Editions of Harry Potter and the Prisoner of Azkaban, and Harry Potter and the Goblet of Fire are to be released on Blu-ray Disc. These Ultimate editions are jammed packed with special features, including parts three and four respectively of the eight-hour documentary ‘Creating the World of Harry Potter’, which will ultimately span across all eight Ultimate Edition Blu-ray Discs. Part three looks at the creatures from the series, while part four examines the sound and music. BD-Live content is also promised for both films. Other collectable bonus content from the Ultimate Editions includes character cards, books with over 40 pages of behind-the-scenes material, and lenticular cards. The Ultimate Editions are due for release on October 4. The HDRoom has more details. A new demo disc showcasing all aspects of Blu-ray Disc has made its way across Europe. The disc consists of a five-minute promotional trailer extolling all the virtues of BD, including comparisons of the video and audio quality with DVD, examples of interactive BD-Live content and information on how Blu-ray technology works. The video is illustrated with scenes from some of this year’s most anticipated BD releases, including Transformers: Revenge of the Fallen, Star Trek, Harry Potter & the Half-Blood Prince, Fast & Furious, Public Enemies, The Hangover and Up. The message is clear: without Blu-ray Disc, your HDTV is just a TV. The video, available to view below (make sure you click HD! ), is an important promotional asset that is available to retailers and all BDA member and contributor companies to host on their websites and for use in store. With the festive season fast approaching the Blu-ray Disc Association has compiled a list of some of the hottest Blu-ray Discs this Christmas. In its recent report, Futuresource predicted European sales of Blu-ray Discs would reach 31m by the end of 2009. Blu-ray movies are an ideal stocking filler and with the selection of releases available, Christmas shoppers across Europe can be sure to find something to suit everyone. Our recommendations include films that can be enjoyed by the whole family as well as titles to keep the man or woman in your life entertained over the festive period. If you need any more information on these titles, or other new releases hitting stores before Christmas, then do get in touch with us in the comments or via email.